The Alliance of American Football’s inaugural season kicks off on February 9, 2019, and we here at Pro Football Focus will be grading every single player on every single play of every single game in the same level of detail that we do the NFL and major NCAA football slates. With our proprietary grading system expanding, our wealth of data has already shined a light on some players to watch from the new league whether it be from their time in college or their time in the NFL, we have grades from nearly every player on the AAF 52-man rosters for all eight teams. Our Names to Know series will cover every team for the AAF’s first season while giving a brief background on each player’s unique skill set that they showcased previously in their careers. 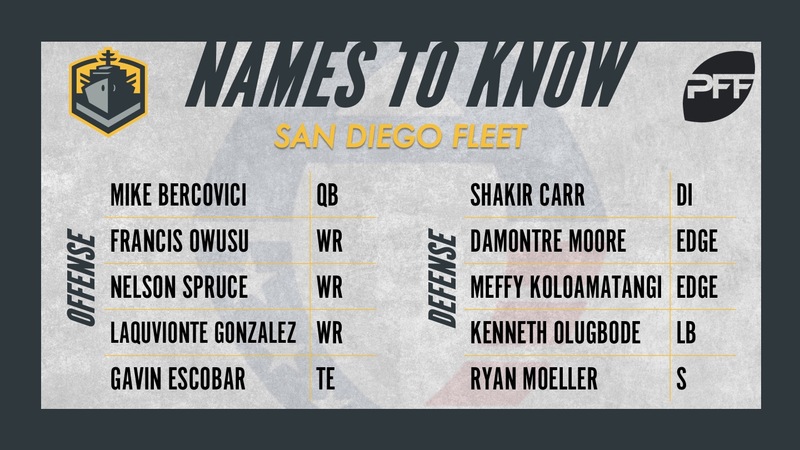 We continue the list today with the San Diego Fleet, head coached by Mike Martz. The former Arizona State signal-caller is far removed from his best football it seems after he had a breakout season with Sun Devils in 2015 but followed that up with two disastrous years in preseason camp with the Los Angeles Chargers. Still, Bercovici has remained the starting quarterback for San Diego throughout camp and despite finishing with the lowest grade of any player (not just quarterback) from the team’s preseason opener (just 28.0 overall), he enters Week 1 with something to prove. If he can fire back up that 2015 season in which he was very impressive from a clean pocket (90.5 overall grade when kept clean in 2015), he stands a strong chance of remaining the starter through the year and maybe even winning some games for San Diego in 2019. Owusu never quite dominated at Stanford like you might have thought he could, still, he was a productive receiving target during the three seasons of grades we have for him as he averaged 13.3 yards per reception from 2014-2016. His time in the NFL was brief and limited to 113 preseason snaps with the Miami Dolphins but he did see action in all four of Miami’s games as recent as last August. He’s a big target for Bercovici at 6-foot-3, and if he can put together some of the big-play ability he’s flashed, he could be more than just a name to watch. Not often do you haul in back-to-back seasons of over 1,000 yards in the PFF grading system and go relatively unnoticed from the outside world. That’s basically what Spruce did as he finished his two seasons of grades from 2014-2015 with Colorado by hauling in 1,197 and 1,056 receiving yards, respectively. He’s a threat with the ball in his hands and forced 22 missed tackles after the catch in that same time span and it’s a real shame that he never caught on with the Chargers after three preseason camps with them. That kind of production from Colorado is hard to find across the AAF landscape so watch out opposing corners. In a case of what could have been, Gonzalez is about as talented as they come, and had he been able to stay with one team, he could have showcased that. With Kansas in 2016, he actually led the nation by forcing 26 missed tackles after the catch, racking up 415 of his 711 receiving yards after the catch. However, the trouble that saw him leave Texas A&M saw him out at Kansas and he was ultimately unable to stick with the Los Angeles Rams after spending his final collegiate season with Southeastern. Now 25 years old, Gonzalez has all the skill to be a mainstay on the top of the depth chart and the top of the receiving charts if he can stay on the field. Escobar heads to San Diego after five years of regular season action in the NFL, most recently bouncing between the Chiefs and Ravens in 2017. He hauled in 30 career NFL receptions and eight touchdowns and saw a career passer rating when targeted of 106.6. His plus-grades in both blocking facets makes him more than just a receiving threat as he could be a fixture on the field for the Fleet. Soto finished the AAF preseason opener with a solid all-around game, albeit on just 12 snaps, however, he has proven he can replicate his college success in two different preseason camps in the NFL the past two years. During his college career that we have grades for, Soto racked up 42 pressures from the interior of the Pittsburgh defensive line while he racked up a ridiculous 32 defensive stops in 2016 alone. He improved his grades every year at Pitt, similarly to how he has improved his grades from his 2017 preseason camp with the Denver Broncos to his 2018 camp with the Oakland Raiders this past summer. Like Escobar mentioned above him here, Moore also brings several years of NFL experience with him as he played significant snaps for the New York Giants, Miami Dolphins and Seattle Seahawks from 2013-2016. He joined the Dallas Cowboys in 2017 and spent 46 snaps with the Oakland Raiders just this past year, last playing in Week 15. He’s got an impressive resume following him as well as extremely recent game action, something not a lot of players have for the Fleet or across the AAF. Koloamatangi brings an impressive display and improved grades every year from his time at Hawaii, recording career-highs in overall grade (73.9), pass-rush grade (69.5), total pressures (32) as well as matching his career-high run-defense grade of 74.7 during his final season with the Rainbow Warriors. He never made it to an NFL roster but his track record and constant improvement to his craft should allow him to see the field often along the edge. A stout defender with an elite overall grade from his final season with Colorado, Olugbode saw time with the Cleveland Browns in the preseason of 2017 but was unable to replicate the college success he saw. Back in that 2016 season with the Buffaloes, Olugbode was a monster, grading out at 88.0 overall and recording impressive marks as a pass-rusher, in coverage and in run defense. His proven ability against some of the country’s best offenses in the Pac-12 that year land him a firm spot on this list. A safety of old, Moeller plays more like a linebacker and hits like a ton of bricks. He was a solid box defender for Colorado during his years there but did has suspect coverage numbers that included allowing 87.0% of his targeted passes to be caught in 2017. Still, he was a dominant run defender and added value as a blitzer as well before sitting out in 2018. San Diego fans better hope that combining the former Buffaloes together pays dividends like it did for Colorado in 2016 when their defense was as stout a unit across the country with Moeller, Olugbode and a host of other current NFLers.